Locking pedestal provides private work storage under Lorell Concordia Series desks, bridges and returns. 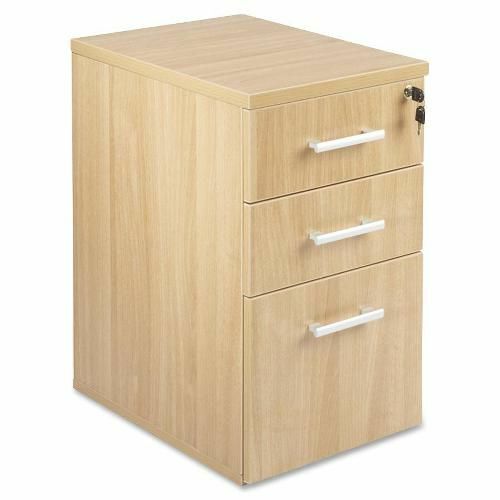 Freestanding design features high-quality Latte laminate, metal cam-lock connection, a box/box/file configuration, 22" depth to fit under your desk, brush aluminum handles and 3mm PVC edges. Two box drawers offer plenty of supply storage. File drawer holds letter-size, hanging file folders with tabs. The Concordia system fosters teamwork and quiet time to focus on individual tasks. Enjoy the flexibility, integration with modern technology and clean design that is the focus of the Concordia series.